both pre-school and undergraduate pairs conformed more often for amendment than distortion. 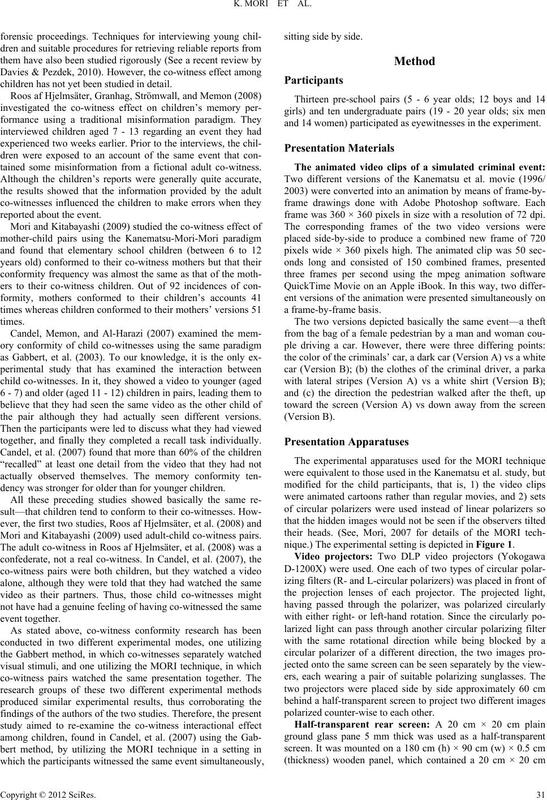 as mother-child pairs (Mori & Kitabayashi, 2009). 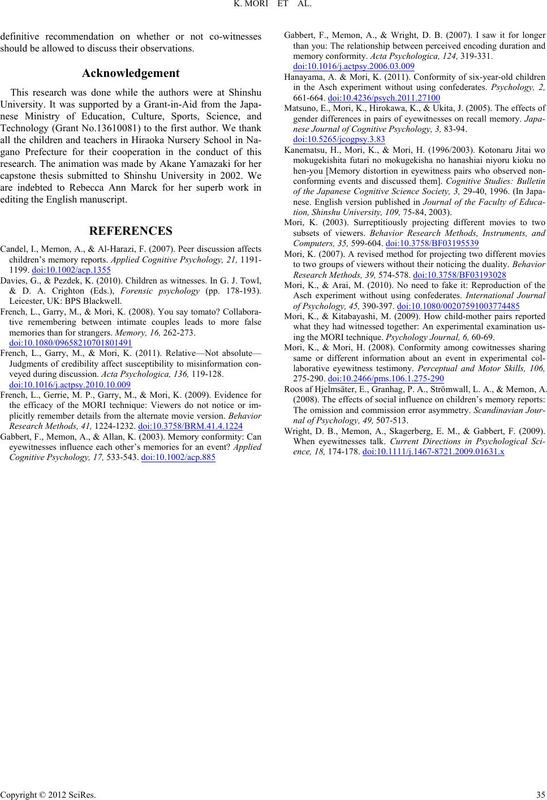 children has not yet been studied in detail. tained some misinformation from a fictional adult co-witness. the pair although they had actually seen different versions. together, and finally they completed a recall task individually. dency was stronger for older than for younger children. 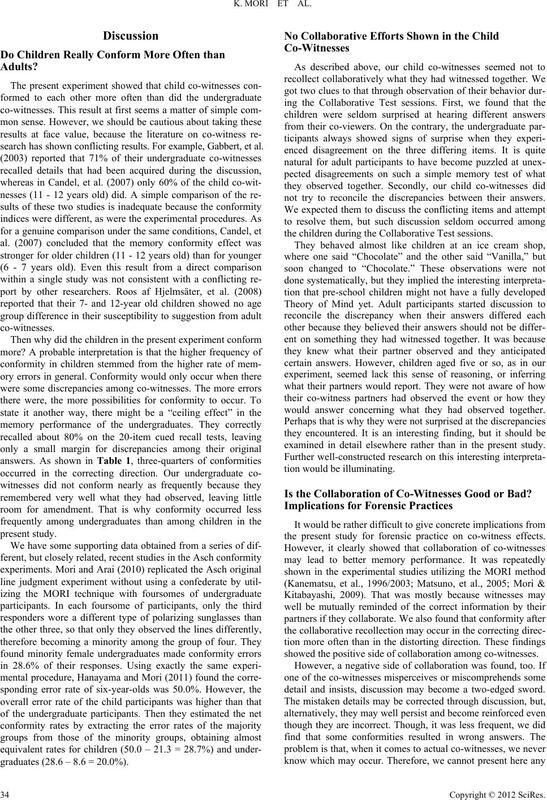 Mori and Kitabayashi (2009) used adult-child co-witness pairs. and 14 women) participated as eyewitnesses in the experiment. frame was 360 × 360 pixels in size with a resolution of 72 dpi. nique.) The experimental setting is depicted in Figure 1.
polarized counter-wise to each other. ously. The actual animation was presented in full color. 1 m away from the viewers. izing filter sheets of 0.8 mm thick (MeCan Imaging Inc., Japan). periods and for all participants. participants in a psychology laboratory. tect their eyes from glare. school pairs to answer the test questions. noticed any anomaly in the video presentation was administered. video versions in the following analyses. school and undergraduate participants for the three test sessions. 84.3, respectively (F(1,88) = 125.56, p < .01; Cohen’s d = 3.16). not significant (F(2,88) = 0.73, ns). member of a pair overlooked or misperceived information. tical lines represent standard deviations). correct information (Mori & Kitabayashi, 2009). and undergraduates (χ2 = .06, ns). (Each pair reported on the 3 target and 17 non-target items). search has shown conflicting results. For example, Gabbert, et al. graduates (28.6 – 8.6 = 20.0%). not try to reconcile the discrepancies between their answers. the children during the Collaborative Test sessions. would answer concerning what they had observed together. examined in detail elsewhere rather than in the present study. Is the Collaboration of Co-Witnesses Good or Bad? 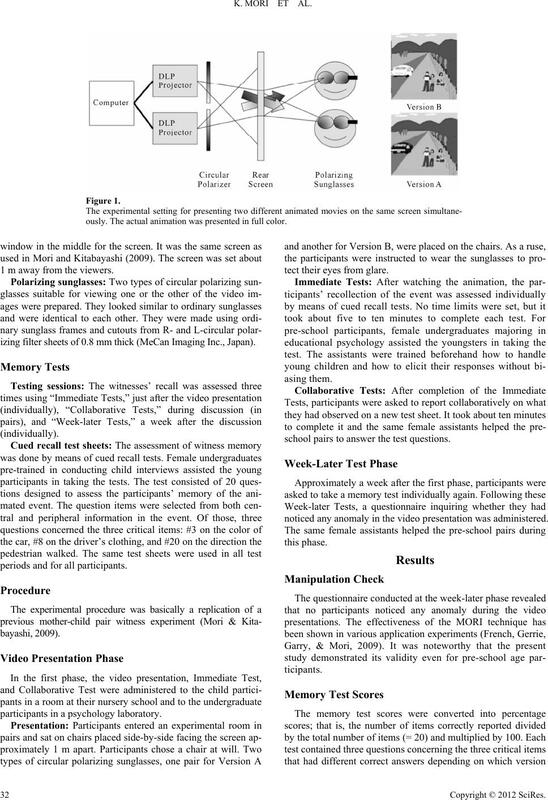 the present study for forensic practice on co-witness effects. showed the positive side of collaboration among co-witnesses. detail and insists, discussion may become a two-edged sword. should be allowed to discuss their observations. & D. A. Crighton (Eds. ), Forensic psychology (pp. 178-193). memories than for strangers. Memory, 16, 262-273.
veyed during discussion. Ac ta Psychologica, 136, 119-128.
memory conformity. Acta Psychologica, 124, 319-331.
nese Journal of Cognitive P sy c h ol o g y, 3, 83-94.
tion, Shinshu University, 10 9, 75-84, 2003). ing the MORI technique. Ps ych olog y Jo urn al, 6, 60-69. Roos af Hjelmsäter, E., Granhag, P. A., Strömwall, L. A., & Memon, A.
nal of Psychology, 49, 507-513. Wright, D. B., Memon, A., Skagerberg, E. M., & Gabbert, F. (2009).